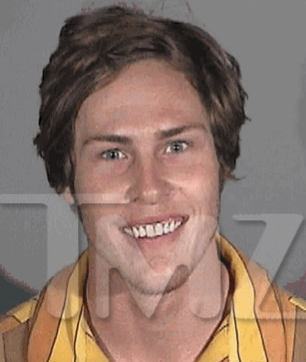 What’s with reality TV stars getting arrested like it’s nobody’s business? Good grief. I am sorry to say that the most recent Survivor winner, Judson Birza better known as Fabio has been arrested in Santa Monica. Police saw Fabio riding a skateboard in the street, which is illegal and when they stopped Birza, they noticed he was acting like a freak, a high as hell one and arrested him. Birza was also booked for an unrelated DUI warrant as well as a probation violation. Who knew he was such a bad boy. I knew he was a hippy. But I didn’t think he was a douche bag. Fabio’s bail has been set $37,000. Do you think he already blew through his $1 million prize? OMG, you can see how high he is in that mugshot. That is hilarious. That smile, those eyes. Trouble, trouble. I would like to point out that at least he was only riding his skateboard high. He could have been behind the wheel. Props for that?